According to the Merriam-Webster dictionary “reticulate comes from the Latin word reticulum meaning small net. Scientists use reticulate to describe a net like formation of veins, fibers or lines that cross something.” Similarly, KDF reticulated cubes have a net like structure. The reticulated KDF cubes share the same treatment properties as KDF but not its inefficiencies: frequent backwashing at high flow rates, channeling and packing resulting in high pressure drop. The net like structure of the cube allows for higher flow rates and easy backwashing. Granular activated carbon effectively removes or reduces chlorine and chloramine. Commercially available point of use filters and pitchers contain KDF -55 or KDF-85 because of its bacteriostatic properties. Adding KDF cubes will prevent or inhibits growth in the carbon tank or cartridge. Adding KDF cubes to your customer’s whole house carbon exchange tanks or filters produces the same effect. Backwashing is not required for municipally treated water where dechlorination, soluble cation heavy metals reduction and bacteriostatic properties are the main treatment goal. Pretreatment with KDF /GAC Filters will prolong the life of water softeners or RO systems. KDF 55 cubes are recommended for reduction of chlorine in municipal water. KDF 85 cubes are recommended for reduction of chloramine in municipal water. Installation of a sediment filter is strongly suggested to prevent particulate buildup in a non-backwashing KDF Cube/GAC filter. KDF-85 is recommended for the treatment of up to 5 ppm of iron, 5 ppm hydrogen sulfide and iron/sulfur bacteria. Through an electrochemical reduction process these contaminants are removed from the water. The weakly bonded precipitates adhere to the KDF cubes and must periodically be backwashed and purged from the system. For more information on well water applications contact Urbans Aqua. KDF Cubes remain on the top of the bed through the backwash cycle. The manufacturer uses a smaller particle size of KDF which gives the KDF Cubes a much larger media surface area than the same amount of granular KDF. KDF-55/85 cubes are proven to be 3-8 times more efficient than the standard large granular KDF. 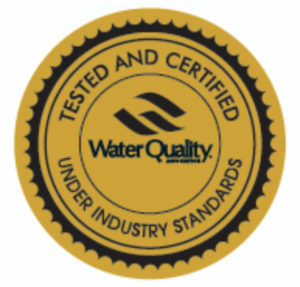 *KDF-55/GAC is recommended for free chlorine treated municipal water. KDF-85/Catalytic GAC is recommended for chloramine treated municipal water. Water Temperature 35° - 150° F.
Shelf Life 1 year; must keep moist. **18 oz. bottle filled with KDF 55/85 Cubes holds 16 oz. of water when filled. Storage: KDF Cubes must be kept damp at all times.